Pulmonary aspergillosis (PA) has become a vital cause of pulmonary fungal infections. The disease is mostly caused by Aspergillus fumigatus and can be invasive, semi-invasive, or noninvasive. The incidence and prevalence of PA are on the rise due to an increase in the number of immunocompromised patients, but the disease is largely unexplored in developing countries. Because of this, it has emerged as a worldwide healthcare problem,,. PA occurs mostly in immunosuppressed individuals and, if not treated early, eventually leads to invasive PA as a result of hematogenous dissemination from the lungs ,. It rarely occurs in immunocompetent individuals but does occur in the presence of other pulmonary or systemic abnormalities such as fibrotic lung disease or treatment with corticosteroids, parenteral nutrition, use of multiple antibiotics, and prolonged hospitalization ,,,,. PA can also coexist or act as a sequel to a previous pulmonary infection, and its symptoms such as nonproductive cough, pleuritic chest pain, fever, and dyspnea are nonpathognomonic. This results in a diagnostic challenge for clinicians who either misdiagnose it or diagnose the disease after the death of the patient [9-11]. Regardless of severe immunosuppression that accompanies advanced human immunodeficiency virus (HIV) infection, there are relatively few cases of PA in HIV patients. This might be due to either highly active antiretroviral therapy (HAART) or the phagocytic cell function that accompanies T-cell dysfunction. However, PA develops in HIV patients with underlying risk factors such as neutropenia, corticosteroid treatment, or even a low cluster of differentiation (CD) 4 cell count (<50 cells/mL) in advanced HIV infection. A healthy, functional innate immune system plays a crucial role in preventing Aspergillus infection. This pivotal role for the innate immune system makes it a main research focus in studying the pathogenesis of aspergillosis,. Although sometimes overshadowed by innate immune response, the adaptive immune response, and in particular T-helper (Th) responses, is also a key player in host defense against Aspergillus. Virtually, all Th subsets have been described to play a role during aspergillosis, with the Th1 response being crucial for fungal clearance. Dendritic cells are the key players in bridging the innate and adaptive immune response against Aspergillus spp. by specifically activating naïve CD4+ T-cells and triggering their differentiation into disparate lineages of effector cells. Clinically, depletion of CD4 T-cell count is a major risk factor for contacting aspergillosis,. The diagnosis of invasive aspergillosis rests upon a sputum culture and histopathology, antigen detection serology, and polymerase chain reaction study. This study was carried out to isolate, identify the etiologies, and determine the prevalence of PA and associated CD4+ T-cell counts among HIV-infected persons with a productive cough (at least <2 weeks) at the HIV Clinic of the University of Maiduguri Teaching Hospital (UMTH), Nigeria. This was a cross-sectional study conducted using blood and sputum samples from 150 antiretroviral therapy naïve HIV-infected individuals. All participants aged between 9 and 55 years were screened and their HIV status was confirmed using Uni-Gold Recombigen ® HIV-1/2 (Trinity Biotech, Wicklow, Ireland) and Determine™ (Alere, Auckland City, New Zealand) proprietary reagents. These samples were collected at the HIV Clinic of the UMTH, Maiduguri, Nigeria. This hospital-based research was conducted at UMTH in Borno State, Nigeria. New cases of HIV infections are diagnosed in this tertiary hospital, and those undergoing therapy are also monitored. Sputum samples were cultured for fungal isolates at the Medical Microbiology Laboratory, while the CD4 T-cell counts in the blood samples were analyzed at the Immunology Laboratory at UMTH. The study was explained to the enrolled participants, and they gave their written informed consent. Parents/guardians gave approval for the participants who were children. Participants were all confirmed seropositive for HIV but without commencement of antiretroviral therapy. A structured questionnaire was used to obtain bio-data from these participants in accordance with the Declaration of Helsinki. Parents/guardians filled questionnaires on behalf of their children. Those who were seronegative for HIV, had not given consent, or had other etiologies with similar pathologies, including active tuberculosis and nontuberculosis mycobacterial infection, as well as other bacterial infections were excluded from this study. Ethical approval was obtained from the Ethical Research Committee of the UMTH, Maiduguri, Borno State. Data generated were anonymously analyzed throughout the study. The sample size for this study was derived using data from a PA cross-sectional study conducted in Maiduguri, Nigeria, by Adisa et al.. Thus, the minimum sample size required for this study was 116 using a 5% error margin and 95% confidence interval. However, statistical credence was given to this study by increasing the sample size to 150. Therefore, a total of 150 volunteers were recruited as participants for this study. Whole-blood samples of 4 mL were collected aseptically in ethylenediaminetetraacetic acid containers and used for CD4+ cell counts. Furthermore, three consecutive early morning sputum samples were obtained from the participants in a sterile plain container for fungal analysis. Samples were collected between April 2016 and August 2016. Blood and sputum were analyzed within 1 h of collection. The sputum samples were inoculated and aerobically incubated in duplicate for 7 days using Sabouraud dextrose agar supplemented separately with chloramphenicol and cycloheximide at 37°C and 25°C, respectively. The fungal isolates were examined morphologically and microscopically and identified using standard biochemical reagents for mycology such as starch and cellulose hydrolysis tests. A large drop of potassium hydroxide solution was placed on a clean glass slide, and a small quantity of the specimen was transferred onto it. The preparation was covered with a clean cover slip, avoiding air bubbles. The slide was kept at room temperature in moisture for 15 min and was observed under ×10 and ×40 objectives. A drop of lactophenol cotton blue stain was placed on a clean glass slide and a small fragment of a colony (cottony, woolly, or powdery) picked from the midpoint of the culture was placed on it and covered with a clean coverslip. After excess stain was removed by blotting, the slide was examined under ×10 and ×40 objectives. Features seen in the stained slide were compared with the established characteristic fungal features such as vegetative and reproductive structures using mycology,. Starch agar medium (starch 20.0 g/L, peptone 5.0 g/L, yeast extract 3.0 g/L, agar 15.0 g/L; pH 7.0) was inoculated with isolated fungal cultures and incubated at 25°C for 5–7 days in an inverted position. The surface was flooded with iodine solution for 30 s, and zones around the fungal growth were observed. Czapek-mineral salt agar medium (KCl 0.5 g/L, K2 HPO4 1.0 g/L, NaNO3 2.0 g/L, MgSO4•7H2O 0.5 g/L, peptone 2.0 g/L, carboxymethyl cellulose 5.0 g/L) was complemented with agar 2% and autoclaved at 15 psi for 15 min and was poured in sterile Petri plates (25 mL/plate) by laminar flow and allowed to solidify. Fungal cultures were inoculated and incubated for 5 days at 35°C in an inverted position. The plate surface was then flooded with a 1% aqueous solution of hexadecyltrimethylammonium bromide for 30 s and observed for clear zone formation around the fungal growth. Based on the manufacturer's instructions, the CD4+ cell counts in the whole blood were analyzed using a Partec™ CyFlow Analyzer (Sysmex, Norderstedt, Germany) Model SL3. This device used the principle of light scattering property (based on dissimilarity in cell size or granularity) and the fluorescence of cells following staining with monoclonal antibodies to markers on the cell surface bound to fluorescent dyes. Cell populations of interest were then gated after identification. Absolute CD4+ cell counts were subsequently analyzed using a single-platform technique. Data obtained were analyzed using SPSS software version 24 (IBM Corporation, Armonk, NY, USA) and were presented as percentages and mean ± standard deviation (SD). Student's t-test was used to compare continuous variables, while the Chi-square was used to compare categorical variables. A P< 0.05 at a confidence interval of 95% was considered statistically significant. Of the 150 samples studied, 19 (12.7%) were culture positive for PA. Two (11%) of these 19 specimens were positive for Aspergillus terreus, 4 (21%) were positive for Aspergillus flavus, 5 (26%) were positive for Aspergillus niger, and 8 (42%) were positive for A. fumigatus [Figure 1]. Based on the assessment of functionality of cellular immunity, HIV participants who were negative for PA (131/150) had significantly higher mean ± SD CD4 T-cell counts (245.65 ± 178.32 cells/mL) than those with PA (126.13 ± 105.27 cells/mL) (P = 0.0051) [Table 1]. PA was diagnosed in 12 of 35 participants (34.3%) with CD4+ cell counts <200 cells/mL, 5 of 52 (9.6%) with counts of 200–350 cells/mL, and 2 of 63 (3.2%) with counts >350 cells/mL. Statistically significant differences were observed between CD4+ cell counts and the occurrence of pulmonary aspergillosis (χ2 = 20.356, P = 0.00004) [Table 2]. Twelve of the 19 patients with PA were male with a prevalence of 22.6% (14/62), which was higher than that of their female counterparts with a seroprevalence of 5.7% (5/88). Seropositivity was decreased in participants aged 25–34 years (25.7%, 9/35) compared with those aged >44 years (12.1%, 4/33). According to educational status, the highest prevalence of PA was 28.6% (2/7) in those who had attended college, while the lowest prevalence of 6.8% (5/73) was recorded in those with a high-school education. In terms of occupation, the highest prevalence of 25.0% (2/8) was found in unemployed participants, while the lowest prevalence of 6.2% (4/65) was reported among civil servants. Statistically significant differences were observed between age (P = 0.00459) and gender (P = 0.0022) and the occurrence of PA [Table 3]. Aspergillus spp. ubiquitously occur as saprobes and are commonly present in the soil. Recently, they have been associated with disease in humans, thus making them a parasite as well,. PA caused by Aspergillus spp. is devastating in immunocompromised patients, and HIV infection is one of the major risk factors due to CD4 lymphopenia. The symptoms of the disease, which include acute productive cough, pleuritic chest pain, hemoptysis, dyspnea, and fever, are nonspecific as they resemble the symptoms similar diseases; this makes the disease insidious and it is a diagnostic challenge. In this study, a persistent acute productive cough, which is one of the common symptoms of the disease, was studied among HIV-infected persons. Recently, the incidence of pulmonary disease in HIV-infected persons with or without underlying risk factors has been reported and associated with mortality,,,. All patients tested were experiencing a persistent acute productive cough, similar to the reports of Denning et al. and Blot et al., confirming acute productive cough as one of the nonspecific symptoms of the disease. The 12.7% prevalence of PA in this study was not the same as the infection rates reported in two other studies from Southeastern Nigeria by Ogba et al. and Ochiabuto et al., who independently reported the prevalence rates of 6.3% and 27.9%, respectively, in HIV patients with a productive cough. These discrepancies could be a result of the positive influence of HAART among these participants as all were volunteers enrolled from treatment centers. 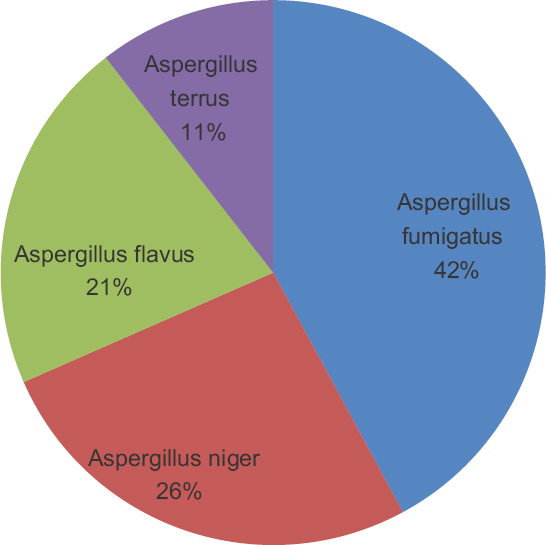 Most studies report that A. fumigatus is the major cause of PA among Aspergillus species. In this study, A. fumigatus accounted for 42.1% of isolates, followed by A. niger, A. flavus, and A. terreus. These findings are similar to the reports of Ved et al. and Ochiabuto et al.. However, Chandwani et al. reported that A. niger was the most common species isolated in their study. These variations could be attributed to variations in geographical locations and ecological niches. Second, A. fumigatus has been regarded by researchers, as the most invasive Aspergillus species due to the high frequency of clinical manifestations (cough, chest pain, fever, hemoptysis, weight loss, and dyspnea) associated with this pathogen as observed in the participants enrolled in this study. In this study, the mean CD4+ cell count of the participants with PA was 126.13 ± 105.7 cells/mL of the blood. Participants positive for PA generally had lower CD4 counts (<200 cells/mL) than their noninfected counterparts. This finding is in conformity with previous studies ,,, that reported aspergillosis in HIV patients with mean CD4+ cell counts <200 cells/mL. Cases of immunosuppression in HIV patients with evidence of low CD4+ cell counts (<200 cells/mL) are associated with the dysfunction or depletion in numbers of macrophages and neutrophils which are considered as sentinels in the eradication of opportunistic infections, including that of fungi. Due to the depletion of these cells, the immune system fails to efficiently eradicate these Aspergillus species, and consequently, this encourages their survival. HIV-Aspergillus coinfection has been observed in patients with CD4+ cell counts much lower than 100 cells/mL, patients with a history of other HIV-opportunistic coinfections, and untreated (HAART naïve) HIV patients ,. The mean age of the participants in the study was 22.4 ± 13.0 years, and majority of the participants positive for PA were between 25and 34 years. This finding is in agreement with Adisa et al.. According to Ogba et al., who reported a similar observation, individuals in this age range have high sexual activity which could be responsible for HIV-Aspergillus coinfection. In this study, more males than females were infected. This is in line with the findings of Njunda et al., who also reported a higher prevalence of Aspergillus in males than females (15.4% vs. 14.7%), but this was not statistically significant (P = 1.0000). The relatively higher prevalence (P = 0.0022) in males might be due to the fact that men often work in areas where Aspergillus is present, such as in the soil. 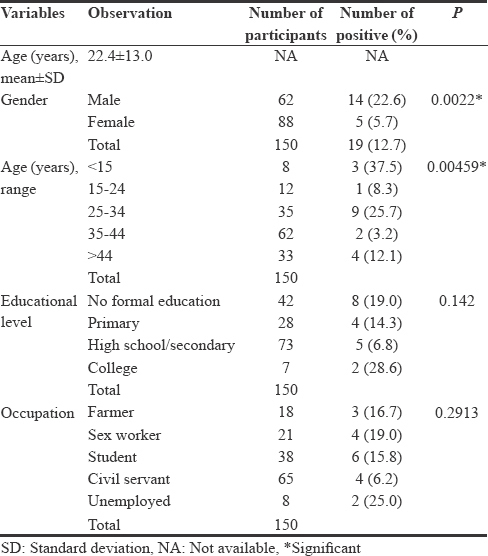 More of the participants enrolled in this study had no formal education, and this could have had an influence on their knowledge of the risk factors related to PA and the need to screen for this pathogen as observed by Jhun et al.. As with occupation, there was no statistical difference in the level of education (P = 0.2913) in infection with Aspergillus species in this study. This study revealed the various etiologies of PA, their rate of occurrence, and association with immune status in HIV-seropositive individuals. CD4+ cell counts could be involved in mycological infection in HIV-infected persons. Even though PA cannot be diagnosed solely using cultural isolation of fungi, findings from this study warrant further studies, especially histological, imaging, and serum Aspergillus galactomannan testing to determine the association with fungal cultural results and the CD4 T-cell count in the diagnosis of PA.
We appreciate the technical support provided by the staff of the Medical Microbiology Laboratory, University of Maiduguri Teaching Hospital, Maiduguri, Nigeria. Ved P, Prem M, Shashi V, Shivani S, Mahendra S. Prevalence and fungal profile of pulmonary aspergillosis in immunocompromised and immunocompetent patients of a tertiary care hospital. Int J Med Res Health Sci 2014;3:92-7. Kousha M, Tadi R, Soubani AO. Pulmonary aspergillosis: A clinical review. Eur Respir Rev 2011;20:156-74. Chawla K, Kosaraju K, Rayasam S, Mukhopadhyay C. Clinico-microbiological profile of chronic pulmonary aspergillosis from a tertiary care centre in Southern India. J Clin Diagn Res 2013;7:2712-5. Njunda AL, Ewang AA, Kamga LF, Nsagha DS, Assob JN, Ndah DA, et al. Respiratory tract aspergillosis in the sputum of patients suspected of tuberculosis in Fako division-Cameroon. J Microbiol Res 2012;2:68-72. Kurhade AM, Deshmukh JM, Fule RP, Chande C, Akulwar S. Mycological and serological study of pulmonary aspergillosis in central India. Indian J Med Microbiol 2002;20:141-4. Biswas D, Agarwal S, Sindhwani G, Rawat J. Fungal colonization in patients with chronic respiratory diseases from Himalayan region of India. Ann Clin Microbiol Antimicrob 2010;9:28. Horger M, Hebart H, Einsele H, Lengerke C, Claussen CD, Vonthein R, et al. Initial CT manifestations of invasive pulmonary aspergillosis in 45 non-HIV immunocompromised patients: Association with patient outcome? Eur J Radiol 2005;55:437-44. Kamii Y, Suzuki J, Matsui H, Matsuki M, Nagoshi S, Ohgiya M, et al. Comparison of clinical features of chronic pulmonary aspergillosis between patients with and without eosinophilia. Am J Respir Crit Care Med 2017;195:A4023. Barton RC. Laboratory diagnosis of invasive aspergillosis: From diagnosis to prediction of outcome. Scientifica (Cairo) 2013;2013:459405. Annaissie E, McGinnis M, Pfaller M. Clinical mycology. 2nd ed., Vol. 2. Amsterdam, Netherlands: Saunders Elsevier; 2009, p. 271-96. Dewi IM, van de Veerdonk FL, Gresnigt MS. The multifaceted role of T-helper responses in host defense against Aspergillus fumigatus. J Fungi (Basel) 2017;3. pii: E55. Denis B, Guiguet M, de Castro N, Mechaï F, Revest M, Melica G, et al. Relevance of EORTC criteria for the diagnosis of invasive aspergillosis in HIV-infected patients, and survival trends over a 20-year period in France. Clin Infect Dis 2015;61:1273-80. Adisa JO, Mohammed B, Egbujo EC, Bukar MA. Cytologic assessment of pulmonary aspergillosis in immunocompromised subjects in Maiduguri North Eastern, Nigeria. J Med Med Sci 2013;4:237-40. Ochie J, Kolhatkhar A. Laboratory techniques in mycology examination of sputum. Medical laboratory science, theory and practice. New Delhi, India: Tata McGraw Hill Publishing Co. Ltd.; 2005, p. 105-33. Ellis D, Davis S, Alexiou H, Handke R, Bartley R. Description of medical fungi. North Adelaide, USA: Mycology Unit, Women's and Children's Hospital; 2007. Hunter BB, Bamett HL. Deuteromycetes (Fungi Imperfecti). In: Laskin AI, Lechevalier HA, editors. Handbook of microbiology. 4th ed. Boca Raton, FL: CRC Press; 2000, p. 1-234. Pula J, Bednarska A, Paciorek M. Invasive pulmonary aspergillosis in a HIV-infected patient with metastatic, non-small cell lung cancer. HIV AIDS Rev 2017;16:195-7. Jabeen K, Farooqi J, Mirza S, Denning D, Zafar A. Serious fungal infections in Pakistan. Eur J Clin Microbiol Infect Dis 2017;36:949-56. Sabino R, Verissímo C, Brandão J, Martins C, Alves D, Pais C, et al. Serious fungal infections in Portugal. Eur J Clin Microbiol Infect Dis 2017;36:1345-52. Denning DW, Follansbee SE, Scolaro M, Norris S, Edelstein H, Stevens DA, et al. Pulmonary aspergillosis in the acquired immunodeficiency syndrome. N Engl J Med 1991;324:654-62. Blot SI, Taccone FS, Van den Abeele AM, Bulpa P, Meersseman W, Brusselaers N, et al. A clinical algorithm to diagnose invasive pulmonary aspergillosis in critically ill patients. Am J Respir Crit Care Med 2012;186:56-64. Ogba O, Abia-Bassey L, Eppoke J. The association between pulmonary Aspergillus infections and the immune status of HIV/AIDS subjects with respiratory symptoms. ARC J AIDS 2016;1:14-9. Ochiabuto O, Nwankwo A, Enweani I, Okoye J, Okeke C, Nwankwo M, et al. Fungal isolation in HIV patients and CD4 count. Int STD Res Rev 2014;2:101-2. Chandwani J, Vyas N, Hooja S, Sharma B, Maheshwari R. Mycological profile of sputum of HIV positive patients with lower respiratory tract infection and its correlation with CD4+T lymphocyte count. J Clin Diagn Res 2016;10:DC28-31. Patterson TF, Kirkpatrick WR, White M, Hiemenz JW, Wingard JR, Dupont B, et al. Invasive aspergillosis. Disease spectrum, treatment practices, and outcomes. I3 Aspergillus Study Group. Medicine (Baltimore) 2000;79:250-60. Khan PA, Malik A, Fatima N, Shameem M. Profile of fungal lower respiratory tract infections and CD4 counts in HIV positive patients. Virol Mycol 2013;2:113. Wallace JM, Lim R, Browdy BL, Hopewell PC, Glassroth J, Rosen MJ, et al. Risk factors and outcomes associated with identification of Aspergillus in respiratory specimens from persons with HIV disease. Pulmonary Complications of HIV Infection Study Group. Chest 1998;114:131-7. Jhun BW, Jung WJ, Hwang NY, Park HY, Jeon K, Kang ES, et al. Risk factors for the development of chronic pulmonary aspergillosis in patients with nontuberculous mycobacterial lung disease. PLoS One 2017;12:e0188716.